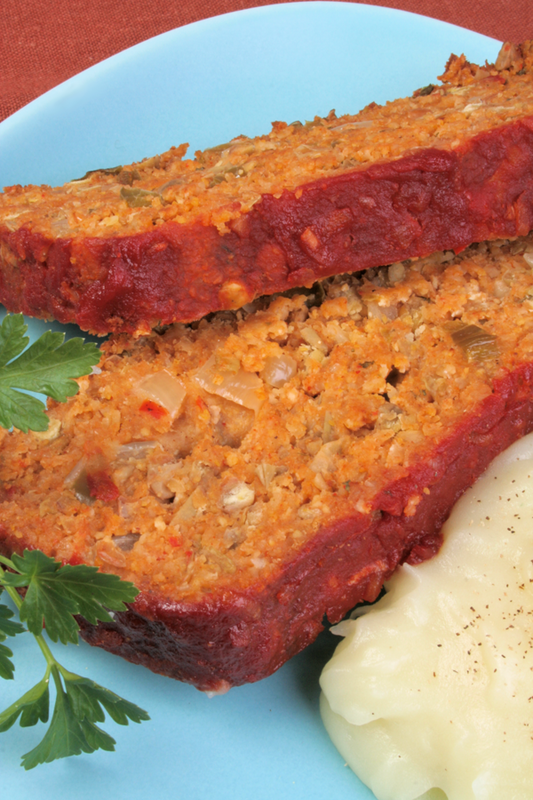 A moist, delicious and easy to slice lentil loaf. Want to know what others thought about this recipe? Would you like to comment on this recipe? Go to the Lentil Loaf blog entry. 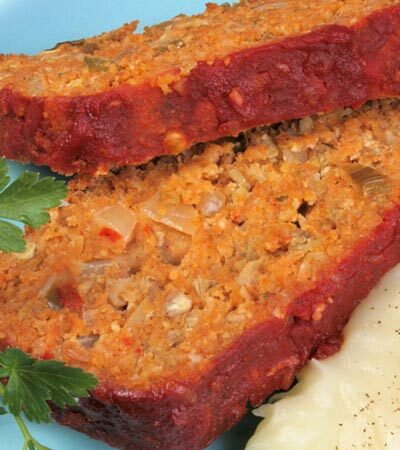 Mix the tomato topping mixture together first because you will need a tablespoon to mix into the lentil loaf. The rest will be set aside to coat the loaf when completed. Add 1 tablespoon of the olive oil to a skillet on medium heat, add chopped onions, red and green bell pepper and let cook until onions are transparent (about 5 minutes), stirring frequently. In a food processor chop oats for 5 quick pulses. Drain tofu well and press with hands until all excess water comes out. In a mixing bowl mash tofu with a fork or use grater to coarsely grate. In the same mixing bowl combine, cooked onions and peppers, 1 tablespoon of tomato mixture, oats, corn meal, lentils, balsamic vinegar, soy sauce, 1 tablespoon olive oil, thyme, cumin, chili powder, parsley, salt, sugar, garlic and onion salt, dried mustard and mix until well combined. Spray a large sheet of tin foil with cooking spray to form loaf on, place on cookie sheet. On top and in the middle of tin foil form loaf mixture into loaf that is 2 1/2 inches tall and 4 1/2 inches square. Coat top and sides with tomato mixture (you will probably have some left over to spoon on later). Cook loaf for 20 minutes, then cover with tin foil and cook for another 10 minutes. After cooking let cool for 10 minutes before cutting into it. This is great from the fridge as left overs, made into a sandwich the next day.